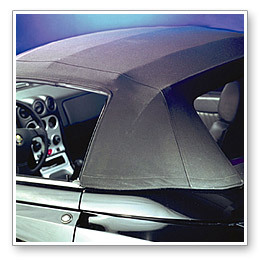 Convertible Top Care Detailing 101: clean and protect vinyl and fabric convertible tops. Convertible top care made easy! A good convertible top cleaner and protectant will prolong the beauty and function of your convertible top. Whether it’s a fabric convertible top or vinyl top, it will benefit from regular maintenance. You’ll find that having a convertible is just as carefree and fun – even more so – when you have a clean, well-protected top. You can achieve proper top care in just a few easy steps. Regular cleaning of your vinyl top is as easy as washing your car. Use a gentle car shampoo, like Pinnacle Bodywork Shampoo, and we recommend the RaggTopp Premium Convertible Top Brush with its feathered bristles to free the dirt from the textured vinyl of your convertible top. Wash the top just as you would the rest of the vehicle. Avoid shampoos that improve gloss. They are good for the paint, but unnecessary for the top. If your vinyl top is particularly dirty, you can use a cleaner to break up the grease and films that can plague your vinyl top. 303 Convertible Top Cleaner can be used on both vinyl and fabric, and it contains no soaps or detergents. 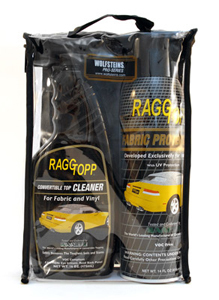 RaggTopp makes an equally effective convertible top cleaner that not only cleans; it also inhibits the growth of mildew. Spray the top with water and then spray with a cleaner. Use a brush to gently scrub the vinyl. Rinse thoroughly. After you’ve cleaned the vinyl, use a vinyl protectant to preserve the color and texture of your convertible top. Skipping this step leads to the faded, cracked tops you see on the road from time to time. RaggTopp Vinyl Protectant comes highly recommended from the top manufacturers of vinyl products, like Haartz and Colgan Custom Bras. It has the best UV protection of any product on the market, and it repels dirt, grease, and oil. It doesn’t make your vinyl top glossy or greasy-looking. It will have the natural matte sheen of new vinyl. as easy as washing your car. Your vinyl top will last longer if you protect it from the start. There’s not much you can do to reverse damage once it’s already been done. Proper vinyl care is as simple as weekly washes with a gentle shampoo, monthly cleanings with a vinyl top cleaner and monthly application of a vinyl top protectant. Fabric top maintenance is essentially the same as vinyl top maintenance, except you want to select products formulated for fabric. Convertible top cleaners are usually suitable for either vinyl or fabric. Use a moderately stiff brush, like the RaggTopp Premium Convertible Top Brush to loosen dirt from the fibers. It’s a marvel of modern science that fabric tops repel water as well as they do, but all good things must come to an end. Fabric tops are chemically treated during manufacturing to repel water and contamination, but these chemicals diminish as time passes. Exactly how long the factory repellant will last is dependent on usage and the environment, so it’s best to keep an eye on your top. Your regular washings should reveal a gradual reduction of water repellence. You’ll want to watch carefully for signs of water puddles or wet spots where water has clearly penetrated the fabric. If you see these signs, it's time to treat your top. We have found in our testing RaggTopp is one of the top products on the market. 303 High Tech Fabric Guard is also a quality product. Either will restore the repellence to factory specifications and keep your fabric top looking good. Be sure to apply protectant to a clean, dry top. Never saturate; light, even coats are always best. Reapply monthly to maintain an optimum level of water repellency. is one of the top products on the market. While choosing the right cleaner and protectant for your fabric or convertible top is most important, having the right tools for the job is another huge factor. Using the wrong brush for the job increases your chance of causing damage to your convertible top with small tears and rips. Luckily, several brushes have been manufactured specifically for the job of cleaning both fabric and convertible tops. The RaggTopp Premium Convertible Top Brush is one of the few brushes designed specifically to work with RaggTopp Convertible Top Cleaners and the only brush to be endorsed by the Haartz Corporation. RaggTopp Premium Convertible Top Brush is manufactured using NYLEX® bristles that are soft enough to cause no damage, but strong enough to fully clean your convertible top. The RaggTopp Natural Horse Hair Convertible Top Brush is packed with thousands of genuine horse hair bristles that gently clean vinyl and fabric convertible tops. Give your vehicle’s convertible top the best care with the RaggTopp Natural Horse Hair Convertible Top Brush! Horse hair has been used for centuries to make brushes because of its natural softness and durability. The windows on convertible tops often age faster than the rest of the top. Clear vinyl is notorious for yellowing, cracking, and scratching. There is a solution, though. Treat the windows with McKee's 37 Plex All. This is a cleaner and protectant that prevents cracking and maintains clarity. Applying Plasti-Care from the day you buy your convertible is a great way to keep those convertible top windows clean and clear. If you already have damaged windows, Wolfgang Plastik Lens Glaze will remove contamination, lessen the yellowing and minimize or eliminate scratches. Seal the plastic with Wolfgang Plastik Surface Sealant for UV protection and long-lasting clarity. Is My Top Fabric or Vinyl?